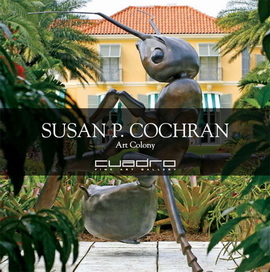 Artist Susan P. Cochran has created a fascinating set of giant ants as part of her insect series of bronze sculptures. I particularly like the balance between anatomical detail and artistic interpretation, as one can recognize in the sculptures all the essential characteristics of an ant. Part of her inspiration, she explains, comes from the social nature of ants, something she reflects in the composition of an egg-laying queen being attended by three workers. The impression in real life must be fantastic. I hope some Museum of Natural History of similar research institution decides to purchase and display some of this work at their entrance yard.